them as well as our with our new charm sets! This sweetie is 'Owl Love You Dearly', isn't he cute! I have used Authentique papers, behind my image is a doily and I am loving the new WOJ 'Tiny Hearts' Pocket Page Die-Light, I can see lots of creations with these new Die-Lights. The little owl is WOJ's new charms, 'Owls' with some WOJ Vintage Linen Button Twine and finished it off with Wild Orchid flowers and some pearls. Your next stop is VICKY'S blog. Aaaaaah another real cutie here. I LOVE owls, and this one is such a cutie, and really awesome colored too. I love it. This is lovely...I like the charm. I don´t like owls as much as other crafters do.... but this one is such a cite and funny one !!! What a sweet owl! Beautiful card! The Little Owl is very cute. Ohh the Owl is soo cut and you Card is beautifuil. Lovely card, very cute Owl. Ein super süßes Kärtchen und das Motiv gefällt mir total gut. ooh, I'm so in love with the new owl stamp and it's so wonderful to see it in real now. You colored it beautifully! Oh this Owl is so sweet. Pretty Card. Ahh what a lovely owl. The samps are great this time . Adorable Colleen! I like the fresh feel of this. Ah, die Eule ist total knuffig! Die Karte ist echt zuckersüß! Eine süsse Karte, die neuen Eulencharms finde ich klasse. This the cutest owl card I have seen. Just darling. 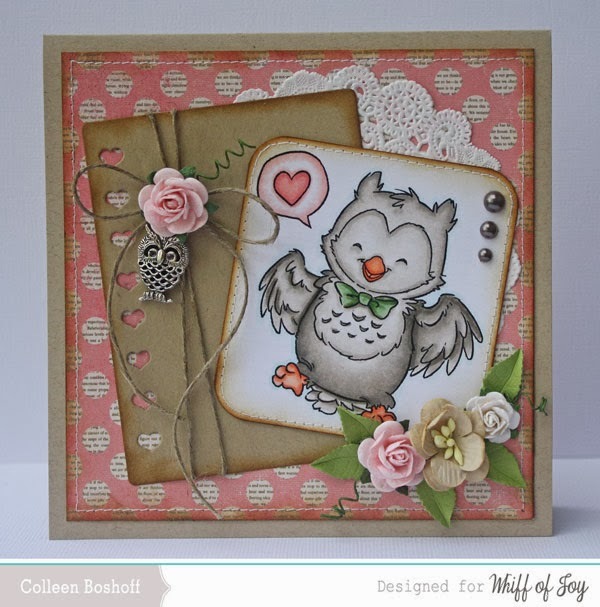 Beautiful card, love the soft colours and gorgeous owl. I love your card with the cute owl. Beautiful card. The Image is so cute. 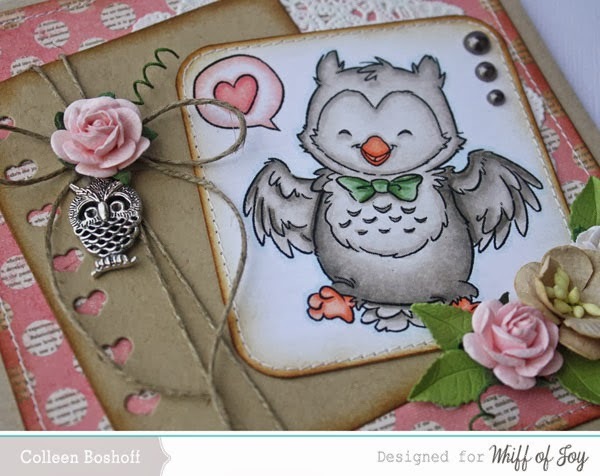 Wonderfull Card with this lovely owl. Love the owl, such a sweet card. Eine sehr süße Eule, gefällt mir richtig gut.